I know this post is late, but Spring Break got in the way. . . I just had to share our Leprechaun Lockdown Challenge!! Just in time for St. Patrick's Day, my sweet friend, Kerry Tracy (curriculum designer extraordinaire), flew in from Washington to do a STEAM lesson with my class. Since my kids love all her STEM challenges, she was like a celebrity to them! You must check out her TpT store; she has tons of engaging products! What always amazing me about the engineering process is the open-mindedness of my students. I'm so black & white (I've come to realize!!) that I stare at all the materials and don't know where to begin. My students, however, immediately begin to discuss, pick up materials and play with them. 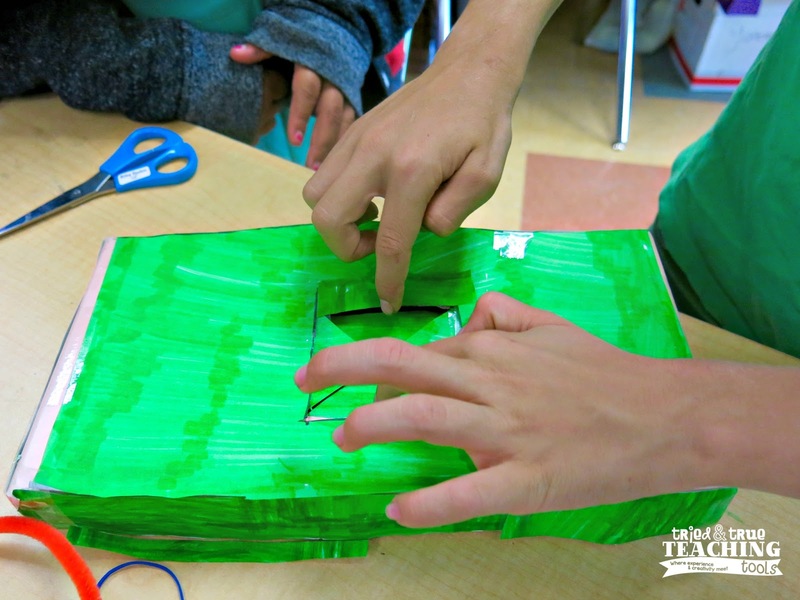 Leprechaun Lockdown is a challenge using boxes, cardboard, tape, pipe cleaners, popsicle sticks, straws, and cotton balls to make a leprechaun trap. However, their trap also had to include elements of Leprechaun Lore. 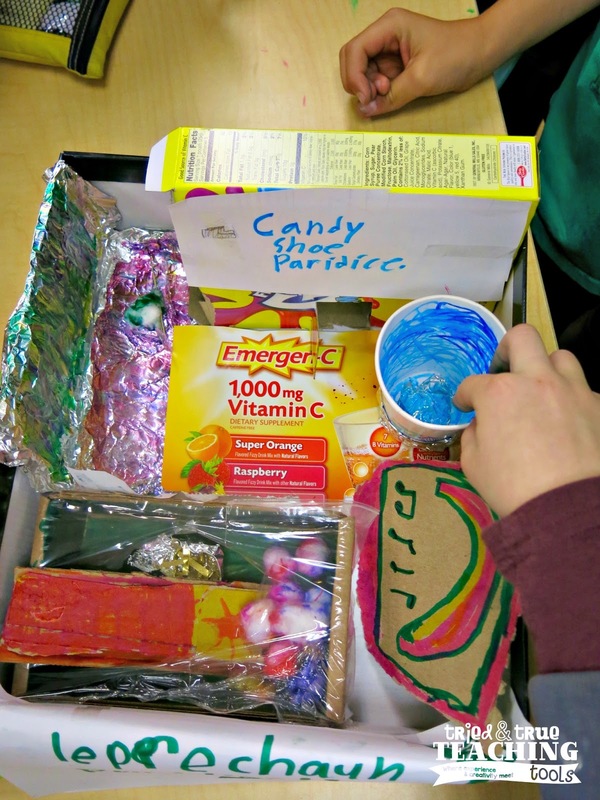 Some kids began to sketch a leprechaun trap, while others started experimenting with actually building. One team built a camouflaged trap door for the leprechaun to fall through while walking. Clever! One of the constraints was that children could not physically touch the leprechaun to catch it. This group had a lure, then made a sort of pulley to quickly lower a box on top of the leprechaun. This group enticed leprechauns with favorites: Candy Shoe Paradise (knowing that leprechauns are usually cobblers), a jacuzzi/swimming pool, a rainbow that plays music, and a colorful cozy bed (that has a tricky plastic wrap cover so once the leprechaun is in, it can't get out)! Students presented their traps to the rest of the class. 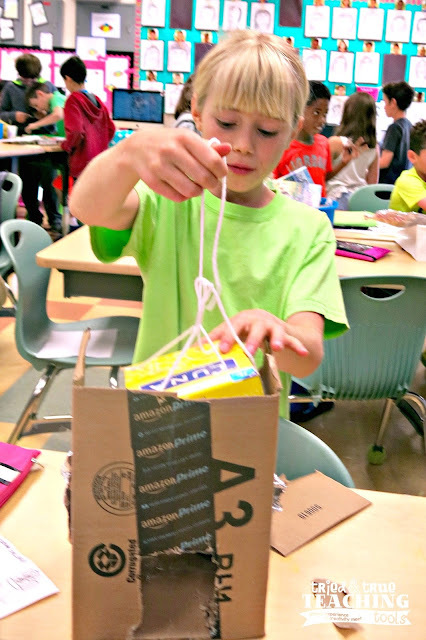 After observing others, teams had the opportunity to redesign their traps. Most groups made changes, then they tested out their lockdowns again. 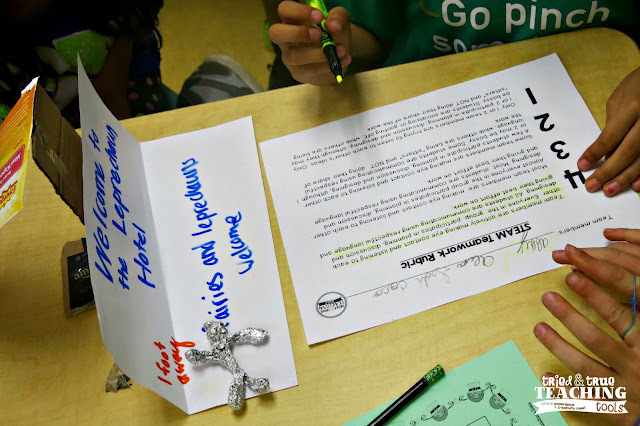 (We used a marble to represent the leprechaun to see if the trap could contain it without rolling away.) It was very interesting to see the improvements! The redesign is more important than the initial design because that's when the critical thinking and engineering challenge comes in! At the end of each STEAM lesson, students fill out a Teamwork rubric. They need to honestly reflect on their interactions with team members. Again, the emphasis on cooperation, problem solving and team building is so crucial! You can grab your copy of the rubric here. 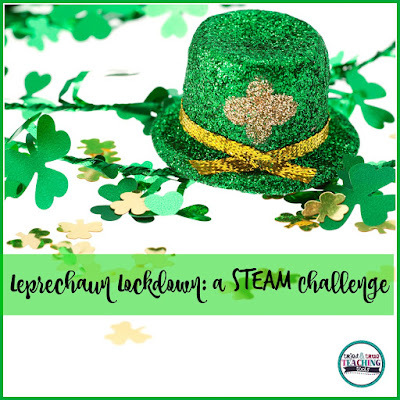 My kids love, love, love these STEAM challenges and they are getting more efficient with their time and ideas. 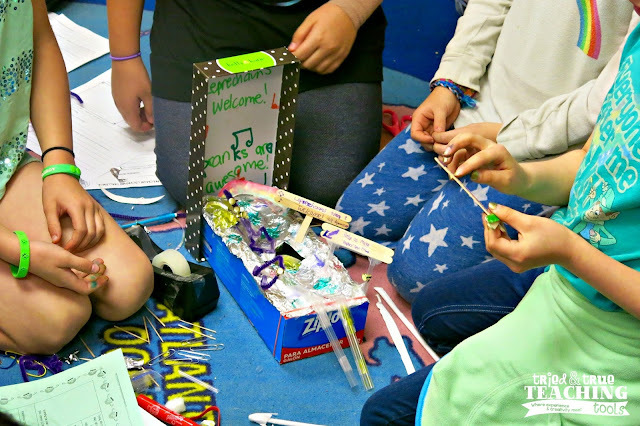 What engineering challenges do you do with your class?